Note: The factory parking light amber lenses will have to be replaced with de Tomaso CLEAR lenses. 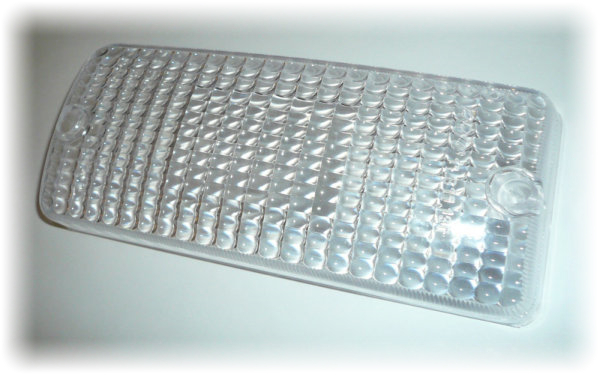 Clear parking light lenses for correct fit are available from Pantera Electronics. 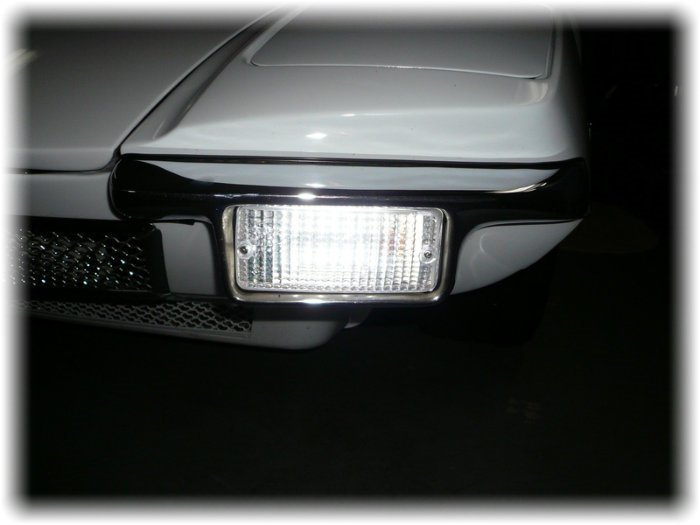 Note that the LED turn signals require electronic flashers to operate properly, the factory Pantera flasher will not operate properly. Pantera Electronics flasher AF-01 can be used with any combination of incandescent lamps or LEDs. 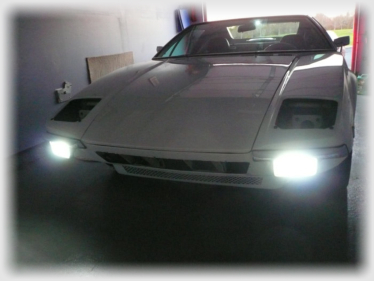 > Front LED array converts parking lights to day-time driving lights. 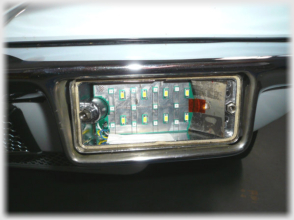 High power white LEDs illuminate clear parking light lenses. > Front LED array changes automatically to amber when the parking lights are activated. > Front LED array changes automatically to amber when turn signals are activated. Returns to white LEDs after turn signals stop. 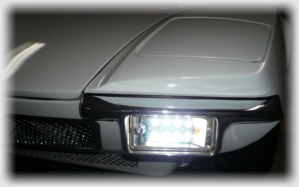 > White LED array can be activated by owner installed switch or connected to the fuse panel and activated when ignition is “ON”. > Easy installation, remove amber lens and bulb, disconnect lamp socket, install LED array and clear lens. > Very low power consumption, very long life in excess of 50,000 hours. Rugged LED technology, no filament to break. 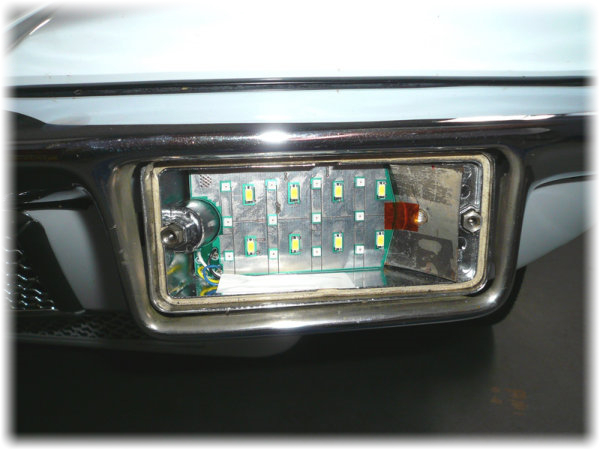 > LED technology allows for day-time use to improve visibility for other drivers ... safer operation for the owner. > Electronically controlled constant brightness, even at idle engine speed. > Simple wiring, matching color wires to the factory harness. > Silver metalized LED reflector replaces the factory chrome plated reflector. > Rusty or inoperative lamp sockets are not used, LED arrays connect directly to the Pantera harness connector. > Modern appearance without distorting the original design. The Front Signal LED array conversion has 2 integrated sets of high power LEDs. An array of white LEDs and an array of amber LEDs. 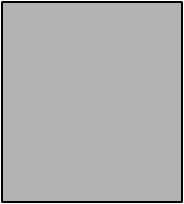 This allows a dual function of the signal light.